Can you help Juna the serpent with a short task, and help relieve her boredom from thousands of years of solitude? There are great rewards awaiting you if you can! 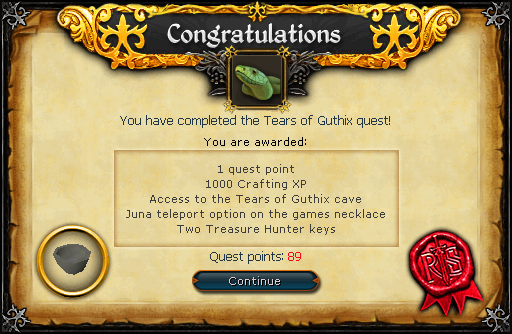 Begin by speaking to Juna in the Lumbridge Swamp Caves. Before you start off, you'll need a Bullseye Lantern with Oil inside. You can craft and smith the lantern, and the Oil can be obtained by bringing Swamp Tar to the Chemist in Rimmington. There is more info about Lanterns in the Crafting, Smithing and Firemaking skill guides. Once you have your lantern, use a Cut Sapphire with it to get a Sapphire Lantern. This must be done while the lantern is extinguished. You must then re-light your lantern before entering the cave. Now head down into the Lumbridge Swamp Caves and traverse to the southeast part of the cave where you'll find some Giant Frogs. Enter the nearby tunnel, and then follow the cliff east, climbing down the Rocks as you need to. Now talk to Juna the Serpent. She seems to be bored and would like a story. You can also ask her about the God Wars. Juna will tell you to bring a Bowl so that you can catch the falling tears. By looking around, you'll find that there is no way to get the stones... this is where the Sapphire Lantern comes in to use. Now use your Lantern with the Light Creatures to attract them and get carried away across the ravine. You'll find yourself on a cliff with some rocks that you can mine. Mine a rock and then Chisel it, and you'll obtain a Stone Bowl. Use the lantern with the Light Creatures again to get across the ravine, talk to Juna, and she'll ask for another story. She will also keep your Stone Bowl for future access to the cave. Quest complete! 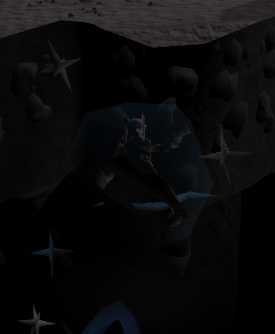 [^] Enter the Lumbridge Swamp Caves with a Sapphire Lantern. 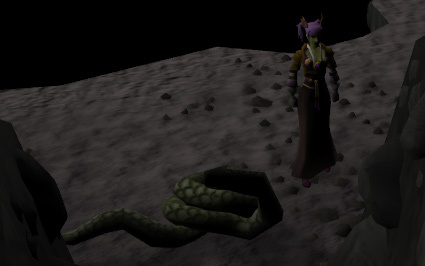 [^] Talk to Juna the Serpent in the southeast part of the Lumbridge Caves.